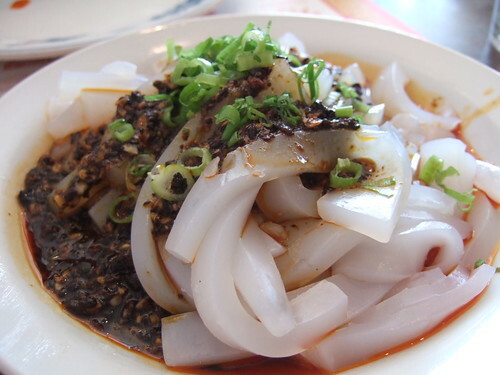 Menu name: “North Szechwan Spicy Cold Bean-Starch Noodles” (chuan bei liang fen). The “noodles” were much like Japanese harusame (mung-bean noodles), but thicker and softer. Despite the name of the place, forget Hong Kong, think Chengdu and Chongqing. For the past two years, Carlos and I have been eating deeply at home from Fuschia Dunlop’s cookbook, Land of Plenty: Authentic Sichuan Recipes Personally Gathered in the Chinese Province of Sichuan. The long, hot, numb buzz of Sichuan pepper and the hearty and deep flavors of Sichuan food moves me deeply: a long overdue visit to Hong Kong Palace in Falls Church was rewarded by a deeply delicious meal. After a marriage-testing four passes on Route 7 across Seven Corners intersection, we finally called and let them guide us in: “We’re across from Sears.” We sit, I’m all blog-bling with my notebook and my dented and scratched Fuji FinePix. I open to the notes I copied from Tyler Cowen’s blog and Washingtonian.com. I ask the waitress to recommend something from the specials board. The board is tantalizingly handwritten in Chinese characters. Being a major kanji dork, I try to read the writing anyway, thinking I might see something Japanese-ish, but I get only “[unintelligible] fish” or “[something-something] tofu.” I give up. She asks if we like spicy food, we say yes, and she tells us to order the “Stuffed Pepper Chicken.” So we do. But first we have some slippery bean-starch noodles with sauce of fermented black beans, green onion, sichuan pepper, and sesame seeds. 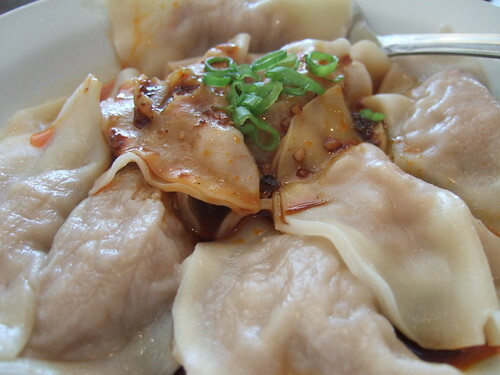 Then some boiled pork dumplings with a chili oil sauce. I’m already grinning and moaning. A more authoritative person appears at our tableside (perhaps the owner?) and asks, “May I ask who told you about us?” When I say, “Tyler Cowen’s blog,” she laughs and gestures to the far corner of the room, “Yesterday, he was here with a big table of guests. Just returned from a foreign country and came to eat here right away.” OMG, I’m a Tyler Cowen groupie. Just missed him. From the specials board July 25th (not on the menu): Stuffed pepper chicken. The chilies were stuffed with sesame seed paste and then fried. Gah, awesome. Crispy fried chicken pieces with garlic and ginger chunks, whole sichuan peppers, hot red peppers, green onions, and peanuts—like the best kung pao chicken ever, but then they add fried medium hot red peppers stuffed with whole sesame seeds and a sesame paste (the pepper and stuffing is crispy and nutty and hot). The earthy sesame nuttiness against the chicken and hot-and-numbing spices is incredible (praise the Zanthoxylum simulans). They sprinkle cilantro over the whole thing; my cilantro-impaired husband will decline the garnish next time. I thought it superfluous myself, but tasty. I asked the waitress to show me the characters for “Stuffed Pepper Chicken” and as I wrote them down she leaned over me, cooing, “Oh, you can do Chinese.” Not exactly. The Chinese characters [口口香脆鸡] have literal meanings of something like “mouth mouth fragrant [tsuki radical and the kanji for “dangerous”] chicken” (kou kou xiang cui ji). I don’t know how they combine into units of meaning. I look later in my Japanese kanji dictionary for the full “dangerous” hanzi. No dice. I find the character only in Fuschia Dunlop’s cookbook as cui [脆], “a certain quality of crispiness, a texture that offers resistance to the teeth, but finally yields, cleanly, with a pleasant snappy feeling.” That is the texture of the fried chicken, yes, but the name of the dish doesn’t seem to mention those outrageous stuffed peppers. The Tasting Table D.C. has a post about the Stuffed Pepper Chicken, see the mention of the “Cantonese” peppers. 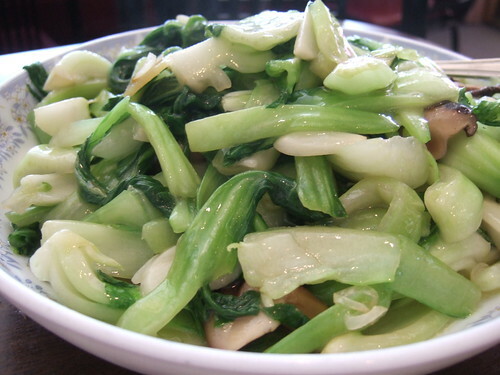 Menu name: “Stir-fried Shanghai Greens and Black Mushrooms” (bok choy, shiitakes, ginger, garlic slivers). The greens were perfectly cooked and this mild standard paired well against the fried chicken. Anyone know what “mouth mouth” (kou kou) means? Do you have a photo of the kanji for Stuffed Pepper Chicken? I’d love to see whether any of our local Szechwan chefs out here in Seattle know it/can make it (sounds delicious!). The characters were: 口口香脆鸡 (also added to the post). I would love to hear what you find out. oooh, that chicken sounds terrific! Fragrantly dangerous? Dangerously fragrant? The chicken was great, but the freakin’ stuffed peppers were amazing. I love this blog. Makes me hungry, though. Axis, out! Hey there stranger, Axis power activated. 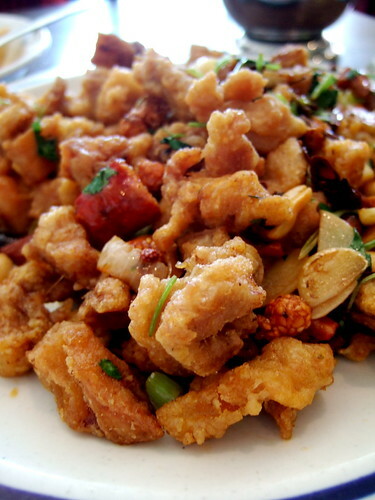 The chinese words literally means “every mouthful is fragrant and crispy chicken”. I just stumbled upon your blog and it captivates me. Thanks for your comment! Welcome. Your blog is great! I was hoping to see a better picture of the Japanese baths (your trip to the B&B) but the food pictures were awesome. I know how to make sushi – but that is about the extent of my cooking prowess. Yum. The baths were closed when we went, the pipes froze! But thanks.